A Savvy woman should never have to compromise quality for beauty. That’s why Savvy Minerals Cosmetics by Young Living™ was formulated to include only the most pristine ingredients. 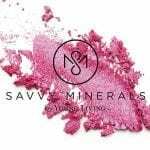 Every Savvy Minerals product was carefully crafted so you can feel fabulous about yourself and what you’re putting on your skin. Our range of products is developed with an unwavering standard of purity and quality, giving you a full variety of naturally derived products made without cheap fillers or synthetics—and that’s a beautiful thing! Wherever life takes you, Savvy Minerals is here to empower you to be the woman you want to be. Say hello to a gorgeous new look and radiant skin with a little help from Savvy Minerals by Young Living™! Savvy Minerals Foundation provides a flawless finish that easily blends into your skin and builds from sheer to full coverage. With a variety of natural-looking shades organized by undertones and skin tones, your perfect match is easy to find! I Do Believe You’re Blushin’ Savvy Minerals Blush by Young Living products. Our blush is gentle, making it ideal for sensitive skin. Passionate Savvy Minerals Blush by Young Living products. Our blush is gentle, making it ideal for sensitive skin. Smashing Savvy Minerals Blush by Young Living products. Our blush is gentle, making it ideal for sensitive skin. Bring out your natural beauty without compromising on quality. Lip Gloss – Savvy Minerals by Young Living provides natural-looking sheer to medium color coverage while adding shine. It applies flawlessly without the sticky feeling of many lip glosses. Bring out your natural beauty without compromising on quality. Embrace Lip Gloss – Savvy Minerals by Young Living provides natural-looking sheer to medium color coverage while adding shine. It applies flawlessly without the sticky feeling of many lip glosses. Crowned All Over Bronzer Savvy Minerals gives skin a healthy, sun-kissed glow, enhances tanned skin and is ideal for sensitive skin. Summer Loved Bronzer Savvy Minerals gives skin a healthy, sun-kissed glow, enhances tanned skin and is ideal for sensitive skin. Misting Spray gives you more thorough foundation coverage, all while nourishing and freshening your skin; free of synthetics. Savvy Minerals MultiTasker is perfect for evening looks; though its sensitive skin formulation will stay put from sunup to sundown. Apply it dry to the lash line for a smoky eye or with a wet brush for a precise, dramatic cat eye. For darker skin tones, bring dimension to your contour by adding it to your foundation or bronzer. Whatever you do with your Multitasker, you’ll be creating a steal-worthy look.